Patient came to the office with a swollen face and pain. Upon entering a heavy purulent exudate emanated from the tooth. 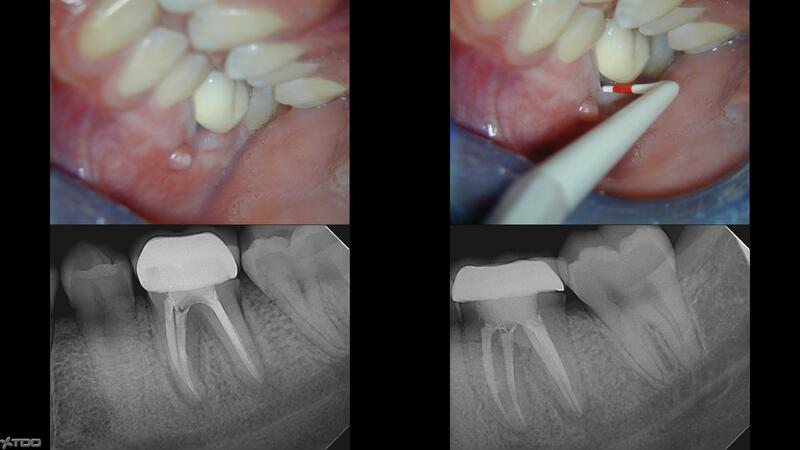 After cleaning and shaping the root canal space the swelling and drainage dissipated. At that time the case was also completed and the patient will be followed-up on a regular basis to determine healing. Acute alveolar abscess. (Extensive gum swelling), resulting from the pulp necrosis, (Nerve death), related to an incomplete crown root fracture as can be seen in the image. As soon as the cause is removed healing starts. At a one month follow-up the tooth is doing fine although the patient is aware that it has a guarded long term prognosis. Upper left molar, patient seen as an emergency with severe pain and unable to bite on the tooth. Pulp necrosis again associated with an incomplete crown root fracture. Patient is under severe stress related to her work. These kind of patients should wear a night guard to avoid fracturing more teeth in the future. 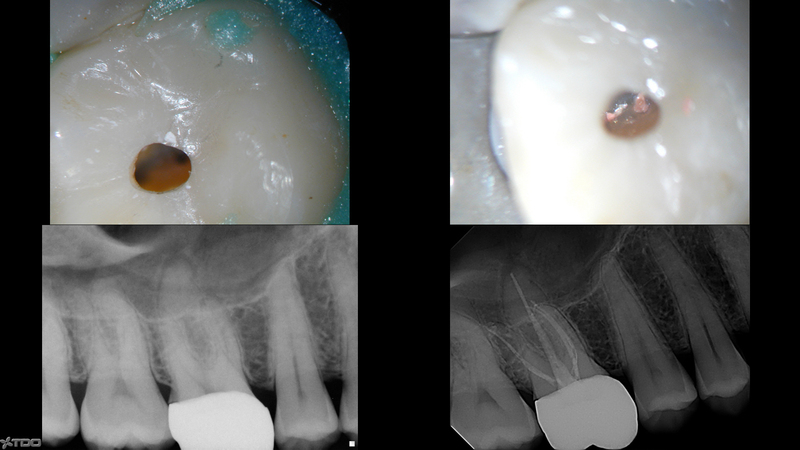 Endodontic treatment completed several years ago. Buccal sinus tract, (aka fistula) has been opening and closing for some time. Patient given a guarded prognosis due to possible strip perforation, (communication between the canals and surrounding tissues). Patient referred for re treatment of upper bicuspid with history of swelling and pain. Previous treatment is failing. Screw type post was removed, canals were re cleaned, shaped to proper length and filled. Patient will be followed up on a regular basis to evaluate healing. Patient was referred for evaluation and possible re treatment. 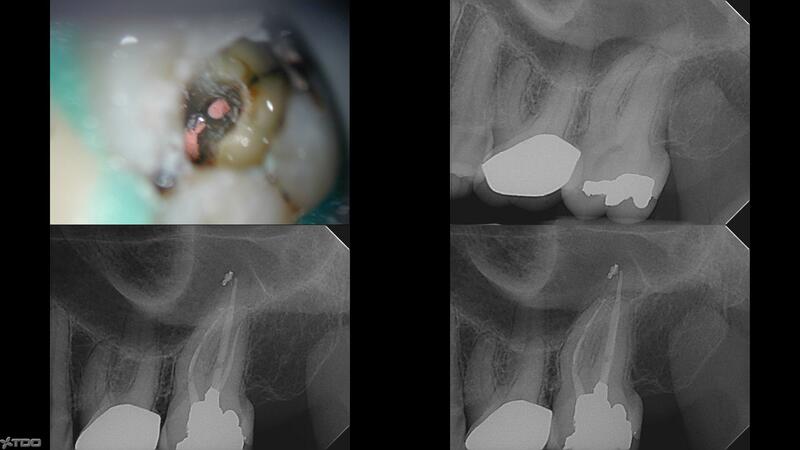 Previously treated tooth and failing outcome. 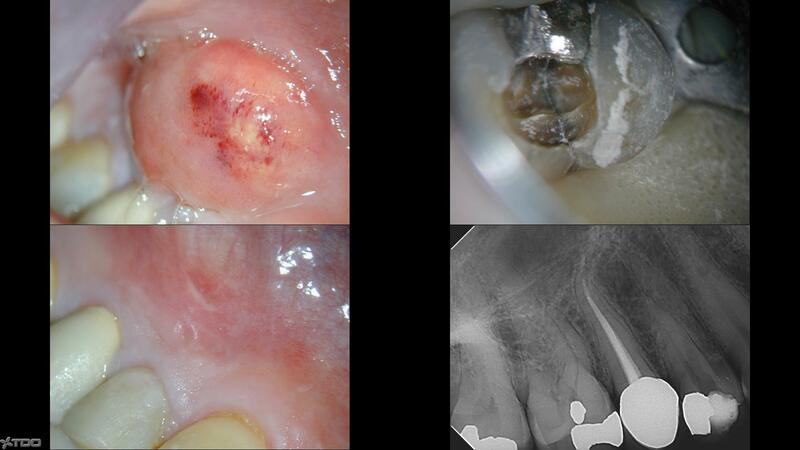 Extensive bone loss as can be evidenced with the periodontal probe. 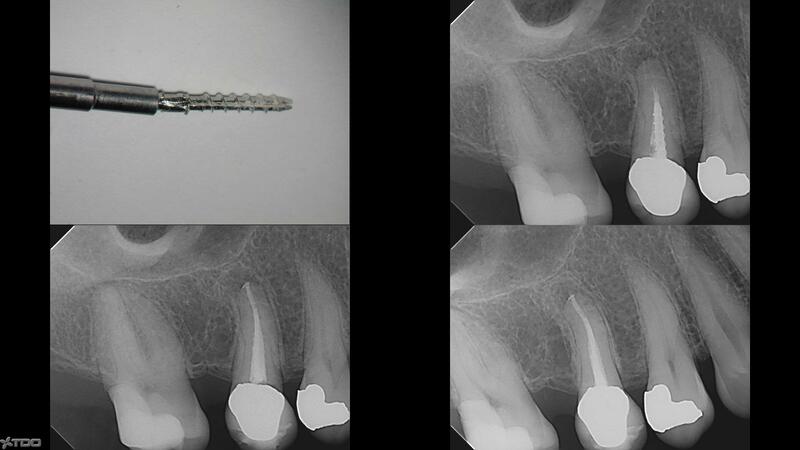 This case was also considered to have a hopeless prognosis due to possible perforation and internal resorptions that could be evidenced using a three dimensional image. (CBCT aka cone beam computed tomography). 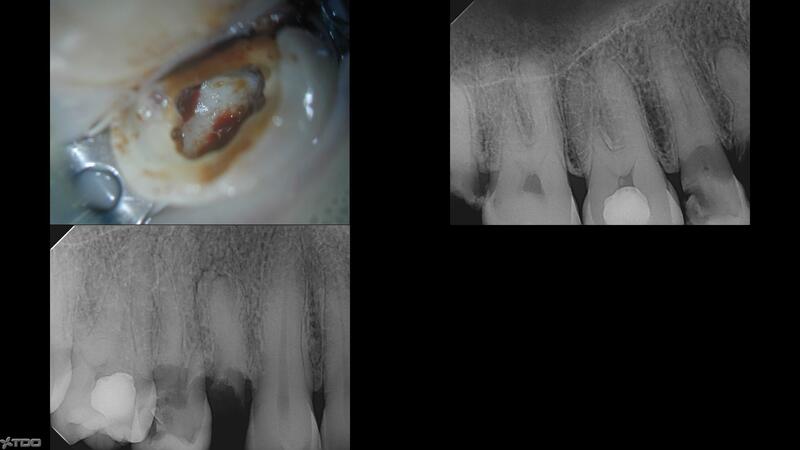 Extensively decayed tooth and patient informed that decay would be excavated and the tooth assessed for restorability. Decay had advanced too much and the tooth was deemed to have a hopeless prognosis and should be removed and replaced with an implant. Note that tooth next to this is also lost due to extensive decay and only the root portion is present embedded in the surrounding bone. 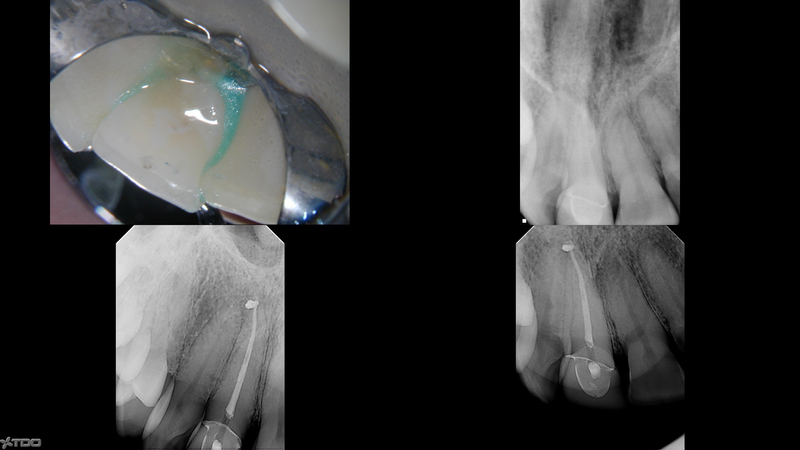 Even through this small access cavity it is possible to find 4 canals, clean, shape and fill them.